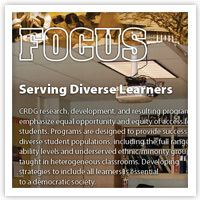 CRDG research, development, and resulting programs emphasize equal opportunity and equity of access for all students. Programs are designed to provide success for diverse student populations, including the full range of ability levels and underserved ethnic/minority groups, taught in heterogeneous classrooms. Developing strategies to include all learners is essential to a democratic society. If you need an alternative format for any of the media on this website, please email crdg@hawaii.edu.